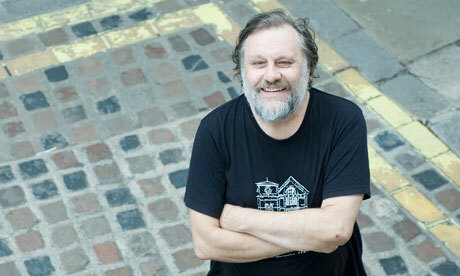 Žižek summons the waiter and orders hot chocolate, Diet Coke and lots of sugar (“I am diabetic”). He is disappointed, he tells me parenthetically, that we didn’t do the interview in the hotel’s adjacent Virginia Woolf burger bar. “What would the Virginia Woolf burger be like?” he asks. “Dried out, topped with parsley, totally overrated. I always preferred Daphne du Maurier.” He then launches into a denunciation of the pretensions of James Joyce, arguing that his literary career went downhill after Dubliners, and then into a eulogy to the radical minimalism of Beckett’s Not I. Within minutes we’re on to German philosopher Peter Sloterdijk’s views on the Malaysian economic miracle, the prospects for Žižek’s film theory course in Ramallah and Katarina Wagner’s production of Die Meistersinger von Nürnberg, in which Hans Sachs is depicted as a Heil Hitler-ing Nazi. One’s task as a reader or interviewer of Žižek is rapidly to build a network of mental pontoon bridges to unite his seemingly autonomous intellectual territories. Is the point of these ‘slice of life’ interviews to teach us how to be normal? He thinks the left actually exists? Or is that just a concept to shorthand ‘the potentiality of opinion’. The attack on Joyce is sign of his conection to Judith Butler. A modest radicalism that wants the same thing only rebuilt. Neo-liberalism and multiculturalism are no more self-rightous then Zizek’s mock universalty of the dirty joke; or his taking a particular ‘Indian’ that is self identified with the same modern pseudo universality as a rule. Why bother with a ‘left’ or ‘right’ when the world is centrally stupid?